Welcome welcome welcome to 'The story behind the shot'. Where I try to explain and deconstruct what was going through my head in making a specific photo. This particular image was of MMA fighter Cameron Else. As with any portrait, the lighting is key to what the photographer is trying to communicate. My vision for the photo was to get a dramatic portrait that encapsulates the dedication of being an MMA fighter. I asked Cameron to look down at around 45 degrees positioning the lighting low and pointing up. The lighting was put very close to Cameron ensuring the light was intense on the front of his face with a big fall off towards the back. To fit in with the minimalist and dramatic vibe, I wanted a pure black background so the black side of a reflector was set up about 2 feet to the right of Cameron. To get a lot of contrast in the photo, I under exposed the image by about 1.5 stops. I also stopped down the aperture to 2.8 (wide open) meaning I would be getting a nice shallow depth of field. The only other technical part of making the photo was changing the camera lighting mode to spot metering. I wanted the keep the details in the highlights so exposed for the brightest part of the shot. As if by magic, the whites stay white and the blacks stay very black! The shot was a tight crop on a 50mm lens. Compositionally, the most important aspect was giving Cameron's eyes enough space to look into the frame. There was also room to get the sweat dripping of his head. The finished photo. 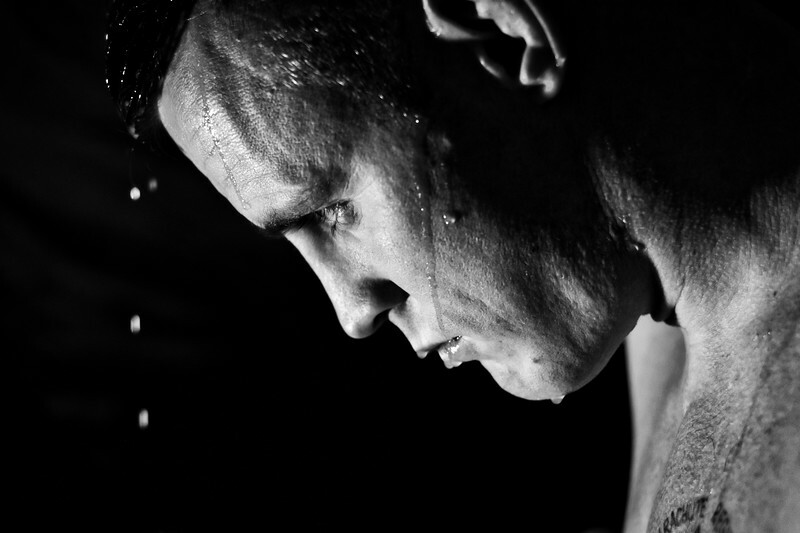 A simple, dramatic portrait that I hope gives a little window into the life of a mma fighter. Hopefully you've found this insight into my thoughts interesting. If you have, it would be great to if you shared. If you haven't, it would be great if you shared.